Eating out has always been important to my family. This was challenging in the days before Seattle became a city with good restaurants. We used to drive regularly from Mercer Island to Magnolia (to go to Szmania’s) for a decent meal. If you are not local, that is about a 40 minute drive and it involves two bridges. Another favorite of ours was a place called Café Sport which was housed right near the famous Pike Place Market, which was closer and it only involved one bridge. The chef there was a man named Tom Douglas and the food was innovative, interesting, and delicious. It wasn’t long before he started creating his own restaurants. He now has a virtual empire. Douglas has just opened a brand new spot but aside from that one, I have eaten at his other five restaurants. I really like all of them. The food focus ranges from pizza to seafood to casual bistro to quintessential Northwest, and most of the time he nails it. Something I deeply appreciate is that there is always interesting vegetarian food to choose from. In a town where you sometimes feel lucky to even get an option on a menu, Douglas usually give you two and both of them sound terrific. Of all of his gems, I think my favorite is Palace Kitchen. It has a terrific bar front and center with friendly and knowledgeable bartenders and giant bowls of pistachio nuts to crunch on while you drink your French 75. The food is hearty and casual but always interesting and seasonal. And they have the most amazing salad. He calls it “Enormous Garlic Crouton and Romaine Lettuce with Parmesan Dressing”. I love that. 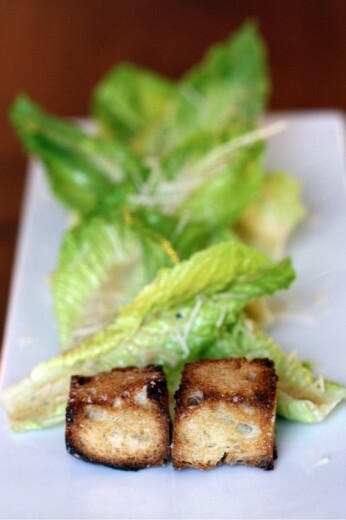 It is most definitely Caesar in spirit and for me the very best thing about a Caesar salad is the croutons. Why not just make a giant one? Palace Kitchen’s is perfect. Crunchy on the outside but soft enough on the inside that you don’t break your teeth trying to eat it. It has enough flavor that I suspect it is cooked browned in a pan with butter and then rubbed down with a raw garlic clove. 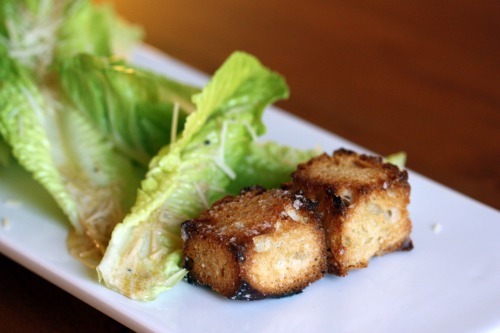 Yes, the dressing is wonderful and the Parmesan is the good stuff, but it is really all about that crouton. I ate that salad the other night before an event at his party venue, and again I marveled at how good it is. Time to attempt a re-creation. Recently I have been making a Caesar-like dressing that I like a lot so I bathed whole romaine leaves in it and sprinkled them with my best Parmesan. I decided to see if I could just douse giant cubes of sourdough bread in olive oil, sprinkle them with salt, and bake them in the oven. And guess what. I could! My bad news is that I actually forgot I was doing that and so, they there were a little more done than I wanted. The other bad news about that is that, as I give you the recipe, I am not exactly sure how long to tell you to bake those heavenly croutons. Forgive me? Preheat oven to 375ºF. Place the bread cubes on a small baking sheet and drizzle with olive oil, then sprinkle with salt and pepper. Turn the cubes a few times on the sheet to make sure they are evenly coated with oil. Place them in the oven and bake until they are lightly browned, but still have a bit of give to them when pushed hard. I’m guessing mine were in the oven about 20 minutes before I remembered they were in there, so check yours around 15 minutes. Once they are done, rub each of them with one garlic clove. Using a garlic press, press the other clove of garlic into a medium bowl. Add the mayonnaise, lemon zest and juice, Worcestershire and Tabasco sauces, a pinch of salt and a few grinds of pepper. Using a whisk, mix together well. Add the olive oil in a slow steady stream, whisking the whole time. Stir in the Parmesan cheese. Taste for seasoning and adjust as necessary. If the dressing seems too thick, you can add more olive oil or even a bit of warm water and whisk well. One by one, drizzle each leaf of romaine with the dressing and sprinkle with more Parmesan cheese. 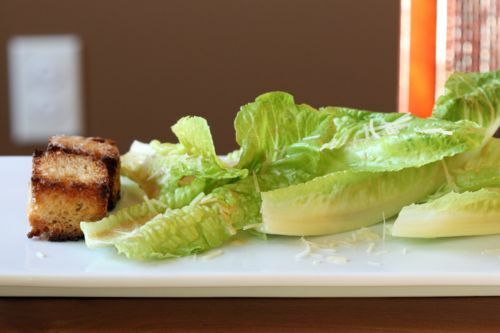 Arrange the croutons along with the romaine on a serving platter. Serve with additional dressing and Parmesan. We loved the Palace Kitchen when we visited- thanks to your suggestion! Can’t wait to try this salad. I have a thing for mini or oversized dishes, they are just so fun! Beautiful presentation! Your salad looks delicious! I always hate it when restaurants give ONE vegetarian option. Whenever I’m cooking for a group of people, I plan for more veg dishes than not because omnivores can always eat the veg dishes but not vice versa. And I firmly believe that is the way it should always be. Large croutons are a fantastic idea! I always hate how small and hard most croutons are. They’re kind of a buzzkill. But these, these sound delicious! Delighted to find your lovely FOOD blog through Jen! I live on Bainbridge Island and am now practicing YOGA with Jen at Bainbridge Yoga House! Don’t get me started on how much I ADORE JEN! Subscribing to Dana’s Treats now! Looking forward to popping over here and checking out all of your lovely VEGGIE dishes! I have three of his cookbooks! Love the brunch at Lola’s! Greg and I will have to try the Palace Kitchen! I know those salted BIG croutons were the BEST! My last night in Seattle after IFBC, I met a friend for dinner (Geri Ann — I think you know her) who said she’d take me wherever I wanted to go. Well, I wanted to go Tom Douglas, and we had a fab meal at Dahlia Lounge. Looking at this salad, though, I’m clearly going to have to come back to Seattle, if only to eat at Palace Kitchen! Those big croutons look great! I have to try that. I love a really well-made caesar salad. So many restaurants offer them, but so few do it well or in any interesting way. I like the whole leaves too. Great re-creation. Oh, I am so fortunate to live in Seattle for so many reasons, and access to Tom Douglas’s creations is most definitely one of them! Love, love, love his food, and the Palace Kitchen is a favorite. I’ve also sat at the PK bar enjoying a lovely French 75 while gorging on delicious food (I especially love the cheese fondue and the coconut pie). Recently, I stopped by the Dahlia bakery and had a fabulous, fabulous breakfast sandwich of local cheddar, fried egg, arugula and bacon on a homemade English muffin…best way EVER to start the day. 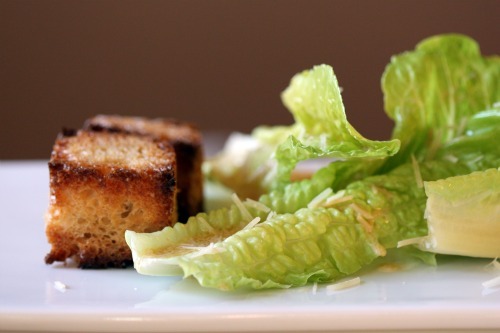 Thank you so much for the recipe…I agree, the crouton IS the best part of a Caesar and I’m always looking for a good, reduced fat Caesar dressing. I’ll definitely give this recipe a try! This is a long time favorite of mine – I love that you recreated it at home!